Yamaha RX-V583 review | What Hi-Fi? The AV receiver is the audio equivalent of the Swiss army knife. Though it won’t uncork a wine bottle, it can be home to seven channels of amplification, have a hi-res DAC, numerous processing capabilites and will play more streaming services than you can shake your smartphone at. 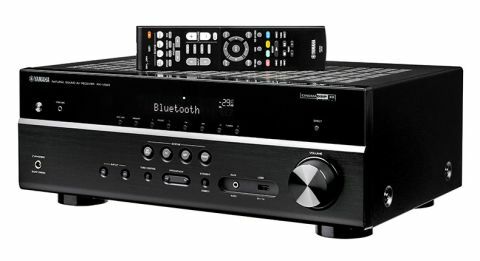 Enter Yamaha’s latest receiver, the RX-V583. With its fair share of challengers, and the company’s own reputation to uphold, how well does this receiver live up to the task? The design of the RX-V583 might divide opinion. In contrast to the Denon AVR-X2400H or Sony STR-DN1080, this receiver has dedicated controls on its front panel for your most common sources ( games console, maybe, and network and digital radios). It’s well built, too - the RX-V583 is solid and sturdy. The volume dial turns slickly, and the chassis feels suitably hefty and rigid. On the back of the Yamaha are four HDMI inputs and one HDMI out. All are HDCP 2.2 compliant, so you can play 4K HDR content. Support for Dolby Vision and Hybrid Log-Gamma is coming via a firmware update later this year. This array is good for the essentials, but still a little lacklustre compared to the six or eight HDMI inputs that Sony and Denon offer. On the purely audio side, there’s an optical connection, two coaxials, and the expected assortment of composite and analogue sockets on the back. There are USB 2.0 and analogue 3.5mm connections on the front, too. As for wireless connectivity, the RX-V583 has Bluetooth 2.1 and wi-fi - and an ethernet port for stability's sake. You can stream from Spotify (the receiver has Spotify Connect built-in) Tidal, Deezer, Qobuz, DNLA and Apple AirPlay. But as yet there’s no confirmation regarding AirPlay 2 support. Chromecast built-in is unfortunately absent, so those that favour it must plug in Google’s hardware instead. You can switch between inputs using the RX-V583’s remote (which is comfortable to hold and easy to use) or through the Musiccast app (which is logical, and laid out with colourful icons for each source). We’d suggest using the latter, as the use of sliders and toggles gives you faster and more precise control over any adjustments you make. With the remote, the same process takes longer because of the multiple menu screens and button presses required. The RX-V583 also ticks off Dolby Atmos and DTS:X , so those that want ‘three-dimensional’ sound from their films will be satisfied. Yamaha has also put its own ‘Cinema DSP 3D’ software into this receiver, as per many previous Yamaha receivers. This aims to recreate the acoustics from music venues like Los Angeles’ Roxy Theatre or New York’s Bottom Line. It’s a neat addition and is certainly fun to play with. Having the simulated scale of a Munich concert hall in your living room is always going to be a party piece - but it’s unlikely to be the last word for audio purists. The receiver can handle hi-res audio up to 24bit/192kHz for (among others) FLAC, WAV and AIFF files, which is suddenly par for the course in a product like this. Before you start playing, you’ll want to go through Yamaha’s YPAO (Yamaha Parametric-room Acoustic Optimizer) calibration process – software that does a similar job to the auto set-up systems on Sony or Denon’s products. Plug in the bundled microphone and let it work out the acoustic properties of your room. This should give you optimum audio performance, although you can go through the menu settings and adjust it further. It’s also worth hitting the ‘Direct’ button on the remote, which plays your stereo sources using the purest signal path to reduce electrical noise. This way, Yamaha suggests, you can achieve “hi-fi sound quality”. We start by playing Stevie Wonder’s Live at Last multichannel concert through the Oppo UDP-203 Blu-ray player, and fast-forward to the toe-tapping Superstition. The receiver kicks into gear, with the slick guitar riffs and confident drums rolling along with an enjoyable momentum and tight timing. Switching to something darker, we play John Wick and the RX-V583 is only too keen to show off its muscle. The deep bass that comes from the pounding club scenes hit you immediately. You’re getting more than just a wall of low-frequencies - the RX-V583 reveals the gritty textures and earthy booms without getting out of hand or becoming overpowering. The Dolby Atmos soundtrack has good size via this receiver, satisfyingly placing the music both above and around you. Elsewhere, cars skid around from right to left and each gunshot is well placed. Being picky, we’d like a little bit more precision - playing the same scene through the Sony STR-DN1080 gives you a greater sense of the location of each sound. But the Yamaha should leave you content nonetheless. Unfortunately, this receiver doesn’t have the same degree of sophistication in its midrange. When Wick forces Ms Perkins to reveal the location of Viggo Tarasov’s men, the venom in her breathless admission comes across bluntly. Even the atmospheric whine from the soundtrack carries a little less tension in its notes when compared to the Denon AVR-X2400H's delivery, which handles the scene with a little more refinement and expression. There’s a similar quality to the Yamaha’s dynamism. While it’s powerful, weighty and energetic, it has more difficulty with the quieter moments. When the high-octane action ends and the clubbers are sent out of the bloodied venue, the RX-583 is a little blunt when conveying the timid, fragile footsteps. There’s also a harsh edge to its treble. Watching Avatar, the cracking twigs and rapid-fire machine guns are a little wince-worthy, and that only becomes more obvious the louder you turn this receiver up. Careful partnering with a refined speaker package is must. The RX-583 is a powerful performer, one that will happily bring a party to whatever you’re playing – whether that’s streaming from your smartphone, from your hi-res music library or a state-of-the-art Hollywood blockbuster soundtrack. It’s a little way behind its rivals from Sony and Denon, but it has a slightly different skill-set - and certainly is energetic enough to entertain. MORE: Denon vs Sony vs Yamaha: which is the best £500 AV receiver?